Recently I've got my hands on a new version of USB Network Gate created by Eltima Software. The idea of this program is quite simple - you can share your USB devices over network and access them from anywhere just like if they were connected directly into your PC (like attaching a network disk). USB Network Gate supports wide range of devices from cameras, printers and scanners to Android devices and Bluetooth adapters. Supported systems include Windows (starting from XP), Linux, Mac and Android. Pricing starts from $89.95 (1 USB port). Owners of the previous version of the product can get a 50% discount. Also, number of client licenses is unlimited. So, start of by downloading a version that works for you and install it on your devices. Installation is really simple - you may choose whether to include both client and server GUI or only client. Client is a device that connects to the shared devise and server, of course, is a machine that shares it. Server must have a license key entered (free 14 days trial is provided). Main window of USB Network Gate. Connecting to a device is simple as well. If you server is on the same network, program will try to discover it automatically. Otherwise, you may click Add server or Add device and provide IP address to connect to. 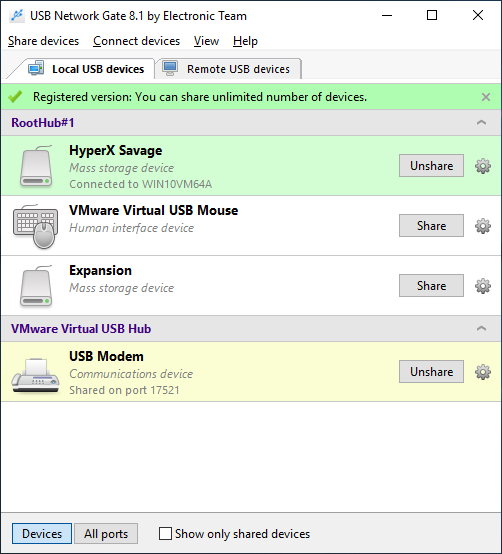 USB Network Gate provides some other nice features like ability to connect devices to virtual machines, access USB over RDP and enable per-session USB isolation (which is remarkably great for terminal servers). So, all in all, a new version of this software seems a very nice and easy-to-use solution that definetely makes your life and bit easier. I've not encountered any problems while using it and really recommend giving it a try to anyone who works with multiple devices. Special thanks to Eltima team for providing me with a free server license to write this small review. Keep up the great work!